A magnitude 6.3 earthquake occurred Tuesday, February 22, 2011, at 12:51:43 PM local time (Feb. 21, 2011 at 23:51:43 UTC), close to Christchurch, New Zealand. No tsunami was reported. At least 160 people died with many more left missing. 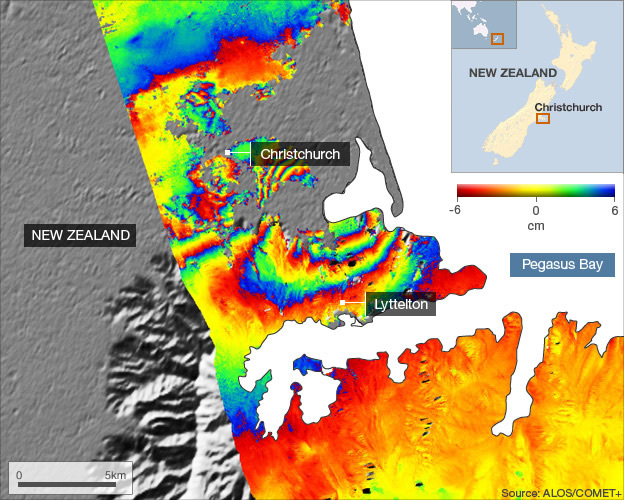 GNS scientists in New Zealand have been measuring and analyzing data from this quake (Fig. 1) and results are plotted on the GeoNet web page. Members of this community explain some of their findings in videos at the GNS Science web page. At UNAVCO, movement at local GPS stations in N.Z. has been determined using distances between sites. See Figures 2 and 3 for the time-series plots from two GPS stations near Christchurch and the resulting coseismic offsets. Their locations are mapped in Figure 4. Various U.S. organizations are involved in reconnaissance and measuring in the field, following this earthquake. For example, the Geo-engineering Extreme Event Reconnaissance (GEER) team will be working with colleagues in New Zealand to provide shear-wave velocity profiling at strong-motion stations and liquefaction sites. Located at the easternmost limit of previous aftershocks from the September 4th, 2010, event, this earthquake is broadly associated with regional plate boundary deformation where the Pacific and Australia plates interact in the central South Island, New Zealand. According to GeoNet, preliminary analysis of seismograph records of the devastating magnitude 6.3 earthquake on Tuesday indicates that it was 9 km from the centre of Christchurch on a buried fault oriented roughly east-west. "There is no obvious structure directly connecting the faults that ruptured in the September’s magnitude 7.1 earthquake with the fault that generated the magnitude 6.3 event. On the contrary, precise aftershock relocations suggest that at least two north-east/south-west trending faults lie between the two and that there is no evidence from the earthquake data of an extension of the Greendale Fault." "The M 6.3 mainshock and a couple other events in the aftershock sequence are reverse (thrust) faulting mechanisms. Also the two events furthest to the west are mainly reverse faulting and may be considered as part of the aftershock sequence to the September M 7.1 earthquake rather than the February 22 earthquake. Most of the remaining mechanisms are strike-slip or mainly strike-slip solutions although the orientation of the fault plane is variable." - Source: GeoNet of New Zealand. Video - GeoNet Data Centre Manager Kevin Fenaughty explains seismic waves and what's been observed in Christchurch. Video - GNS seismologist Bill Fry discusses the February 2011 earthquake in New Zealand. COMET presents SAR interferogram results here that indicate a ~50 cm peak ground motion towards the satellite based on the position of the ground before and after the earthquake. See Figure 2. USGS web page: details, tectonic summary, shakemaps, and more on this earthquake. IRIS Recent Earthquake Teachable Moments has PowerPoint slides and PDF of the slides on this event for teachers to use! Educational Slides by the National Earthquake Information Center of the USGS: a PDF with maps, tables, and other graphics of the two New Zealand earthquakes (2010, 2011) compiled by Gavin Hayes. Fact Sheets compiled by IPENZ, the professional engineering society in New Zealand, with the help of the Geotechnical Society and the Society of Earthquake Engineering. Another Teachable Moment, this time on Predicting versus Forecasting Earthquakes: "Moon Man," Ken Ring, claims to have predicted the 2011 Christchurch earthquake, and a media storm has followed. Scientists from GNS and universities have addressed this and the problem with the concept of earthquake prediction in this article. Video footage of a slope collapsing during earthquake. Link to the UNAVCO Highlight on the Sept. 4, 2010, M7.0 Christchurch earthquake. New Zealand Herald - newspaper articles on the earthquake. Figure 6 - Rescuers serach for trapped survivors in a collapsed building in the Feb. 21st M6.3 earthquake in New Zealand. Photo by Mark Mitchell, AP Photo/New Zealand Herald.